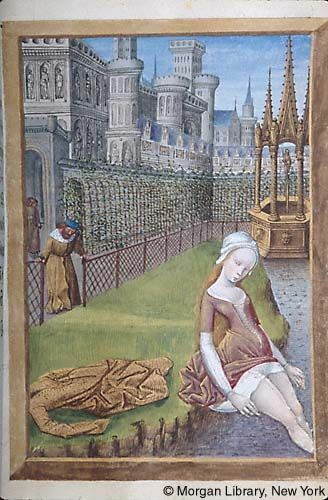 In earlier posts we ave looked at different signs of melancholy, which is generally the ancient diagnosis that best corresponds to madness or depression. In this letter, Hippocrates seems to describe a manic dedication to one thing paired with other antisocial symptoms. “We might encounter good fortune and then we will arrive, as we imagine, with better hopes as was made clear in the letter, if the case is that the man is not displaying madness but instead some overwhelming strength of spirit—this despite the fact that he is considering neither children nor wife nor relatives nor any other thing at all—and he has spent day and night by himself staying alone, for the most part in caves or deserted places or under the shadow of trees or in soft grasses or alongside the quiet flows of water. It is many times the case for those suffering from melancholy to exhibit these kinds of behaviors. Such people are sometimes quiet and solitary and love isolation too. They keep themselves apart from people and consider their own tribe to be a foreign sight. But it is not unreasonable for those who have been dedicated to education to shake off other thoughts because of a single category in wisdom. For, just as slaves and slavewomen who are yelling and fighting in their homes, when their mistress suddenly appears, step apart in quiet because they are afraid, in the same way too the rest of the thoughts of in human minds are servants of evils; but when the sight of wisdom made itself seen, the rest of the sufferings have retreated like slaves. ἄντροισι καὶ ἐρημίῃσιν ἢ ἐν ὑποσκιάσεσι δενδρέων, ἢ ἐν μαλθακῇσι ποίῃσιν, ἢ παρὰ συχνοῖσιν ὑδάτων ῥείθροισιν. Συμβαίνει μὲν οὖν τὰ πολλὰ τοῖσι μελαγχολῶσι τὰ τοιαῦτα· σιγηροί τε γὰρ ἐνίοτε εἰσὶ καὶ μονήρεες, καὶ φιλέρημοι τυγχάνουσιν· ἀπανθρωπέονταί τε ξύμφυλον ὄψιν ἀλλοτρίην νομίζοντες· οὐκ ἀπεοικὸς δὲ καὶ τοῖσι περὶ παιδείην ἐσπουδακόσι τὰς ἄλλας φροντίδας ὑπὸ μιῆς τῆς ἐν σοφίῃ διαθέσιος σεσοβῆσθαι. ῞Ωσπερ γὰρ δμῶές τε καὶ δμωΐδες ἐν τῇσιν οἰκίῃσι θορυβέοντες καὶ στασιάζοντες, ὁκόταν ἐξαπιναίως αὐτοῖσιν ἡ δέσποινα ἐπιστῇ, πτοηθέντες ἀφησυχάζουσι, παραπλησίως καὶ αἱ λοιπαὶ κατὰ ψυχὴν ἐπιθυμίαι ἀνθρώποισι κακῶν ὑπηρέτιδες· ἐπὴν δὲ σοφίης ὄψις ἑωυτέην ἐπιστήσῃ, ὡς δοῦλα τὰ λοιπὰ πάθεα ἐκκεχώρηκεν.